The canopy frame is braced using temporary channels to ensure proper geometry and alignment. 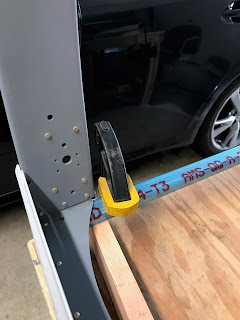 I clamped the cross channels to the bench to hold everything stationary while riveting. 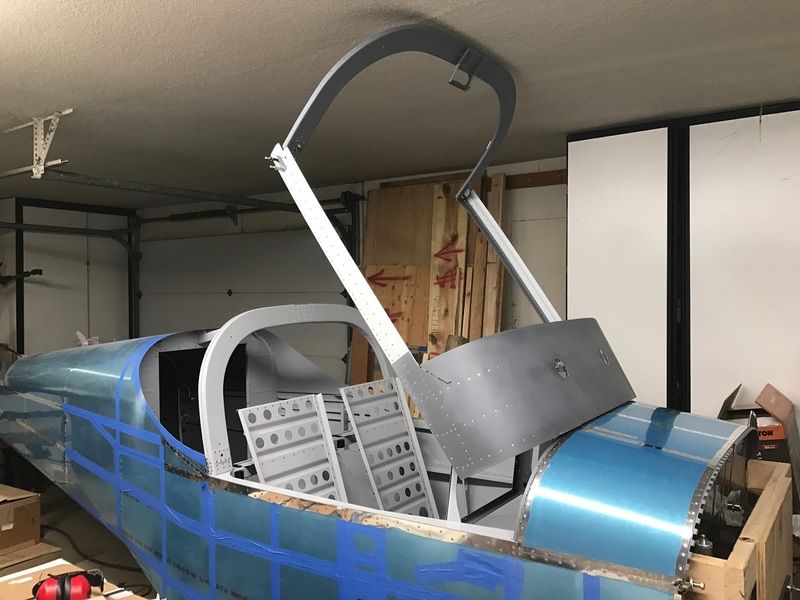 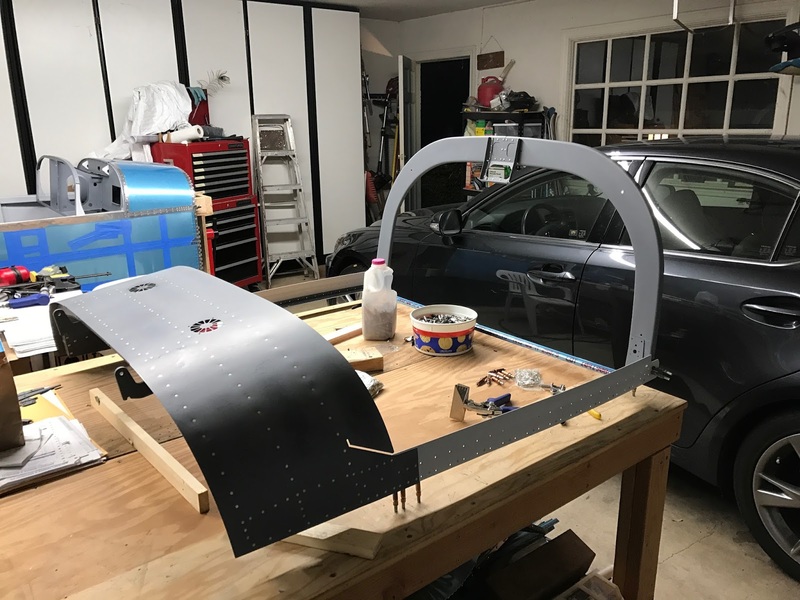 The canopy frame fit very nicely on the fuselage after assembly. 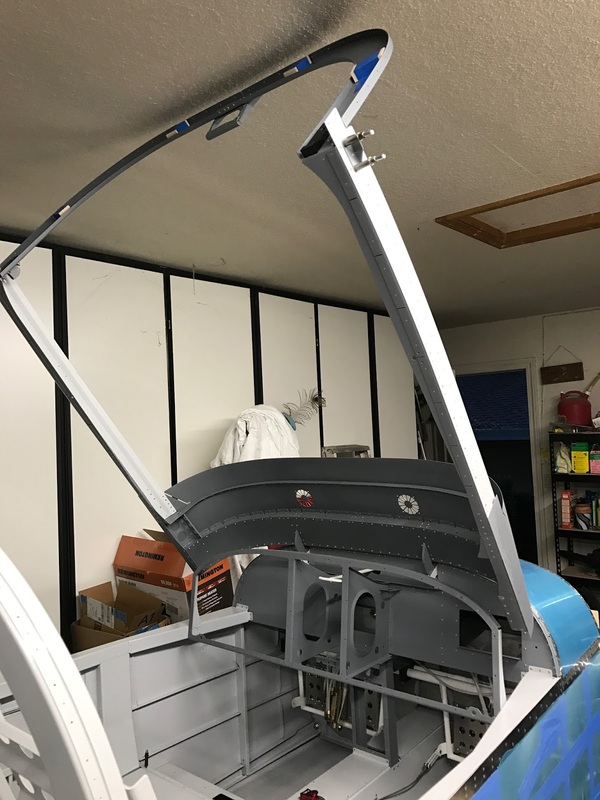 I attached the side rails to the forward section of the canopy frame and did some more riveting today. 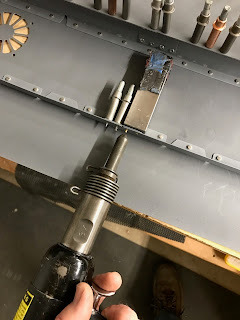 I couldn't fit the squeezer on these rivets so I resorted to using the gun as seen below. 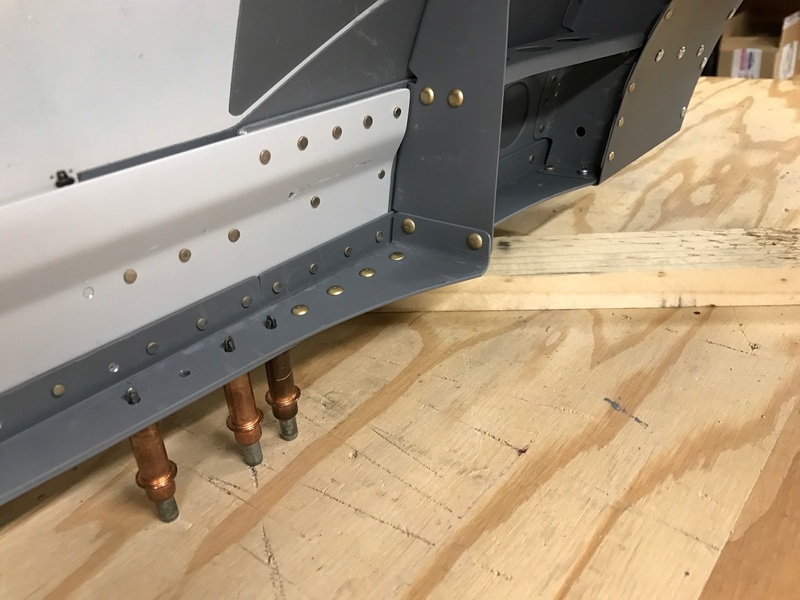 When you pull the rivets into the lower decking, the whole structure gets much stiffer. I started riveting the canopy frame today. Did some counter sinks and other prep work on the canopy frame today. 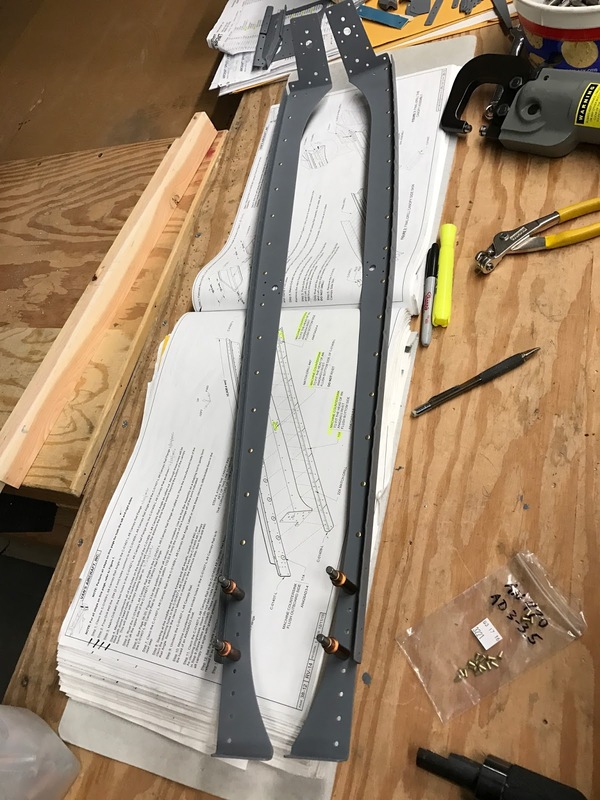 Here is the aft canopy frame and the canopy handle after riveting. The canopy assembly assembled with a many clecos. 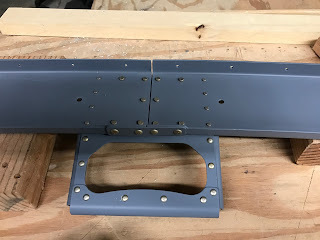 The cross bar channels are temporary to help with alignment. 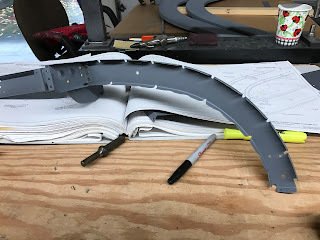 Started work on the canopy rails. 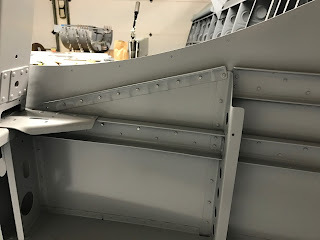 I riveted the seat backs together today. 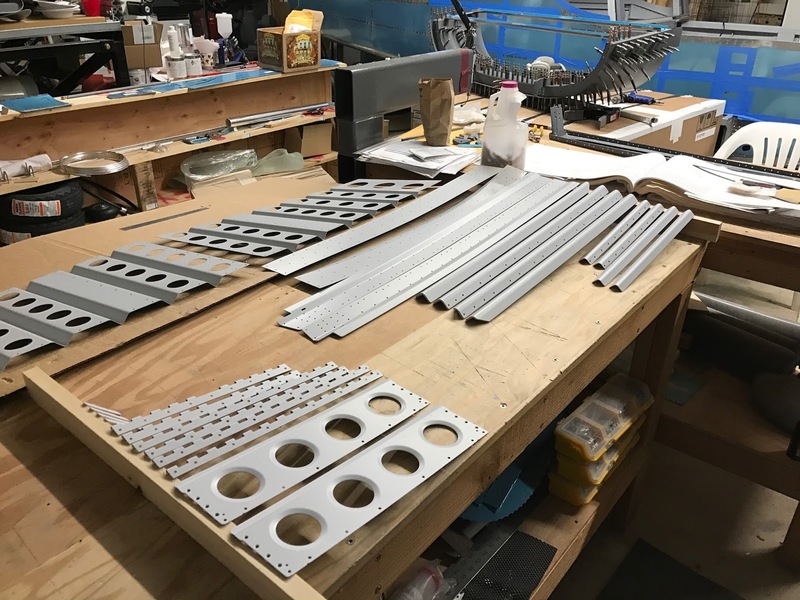 Today was slightly warmer and the sun came out this afternoon so I got busy and scrubbed, acid washed and primed a bunch of parts. I had finished off my last gallon of EkoPrime the last time I did some priming. I was hoping it would last- I don't have very many more parts to prime, but painting the wing bottom skins cleaned me out. 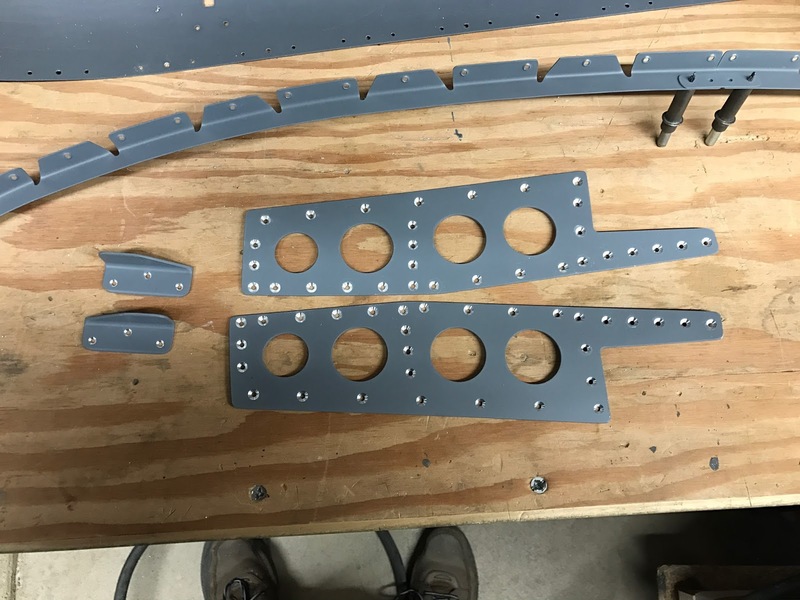 So I ordered another quart from Aircraft Spruce. 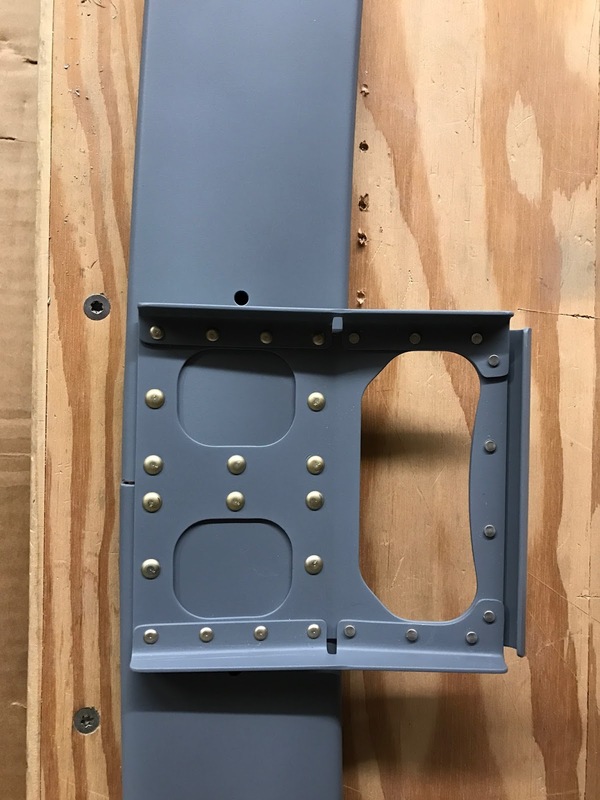 Today I discovered I ordered the wrong color. 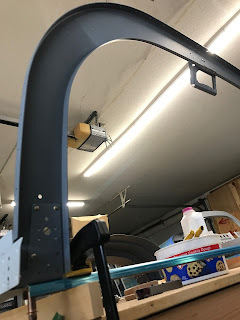 I got Smoke Gray instead of the Charcoal Gray. 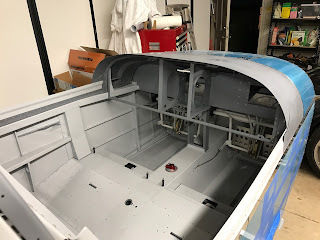 It turns out that the Smoke Gray is much lighter and it will actually be better as an undercoat for the Morning Patrol Gray I'm using for the EkoCrylic top coat in the cockpit. 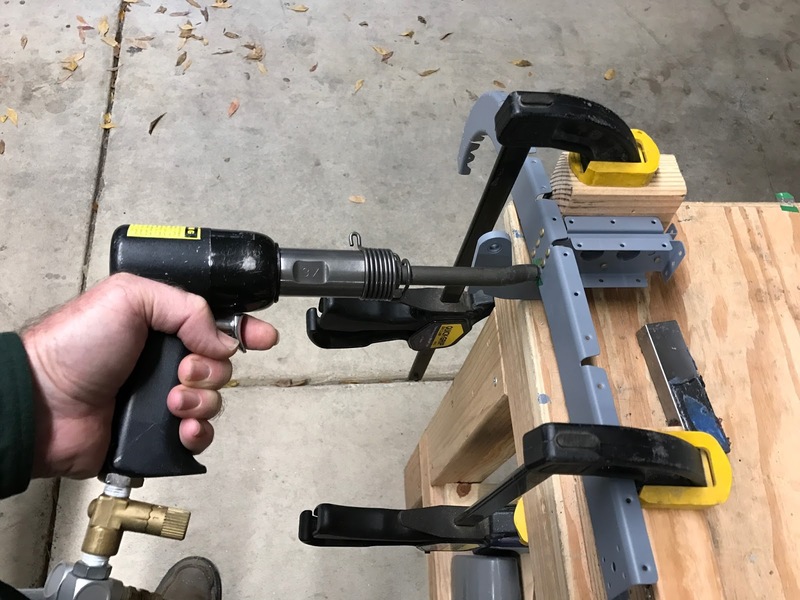 Last week I purchased a butane heater so I could heat the garage. 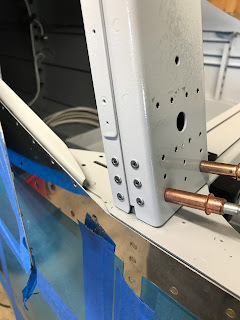 The directions on the EkoPrime can suggest applying with temps between 70-85 degrees F. Ambient temperature today only got up to 58 so the heater came in handy for getting the parts warm enough to paint. 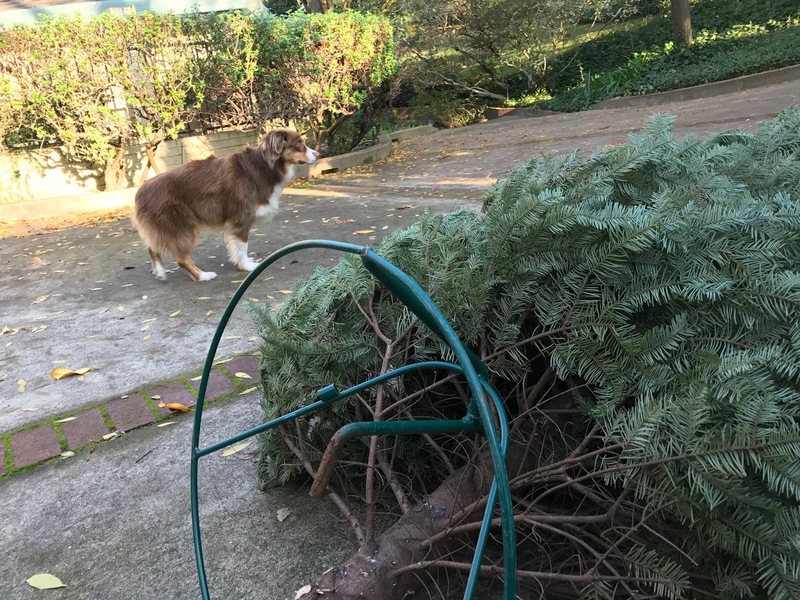 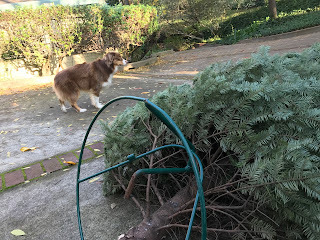 Today Woody, Deb and I picked out a Christmas tree. Woody helped me put on the base and drag it into the house. 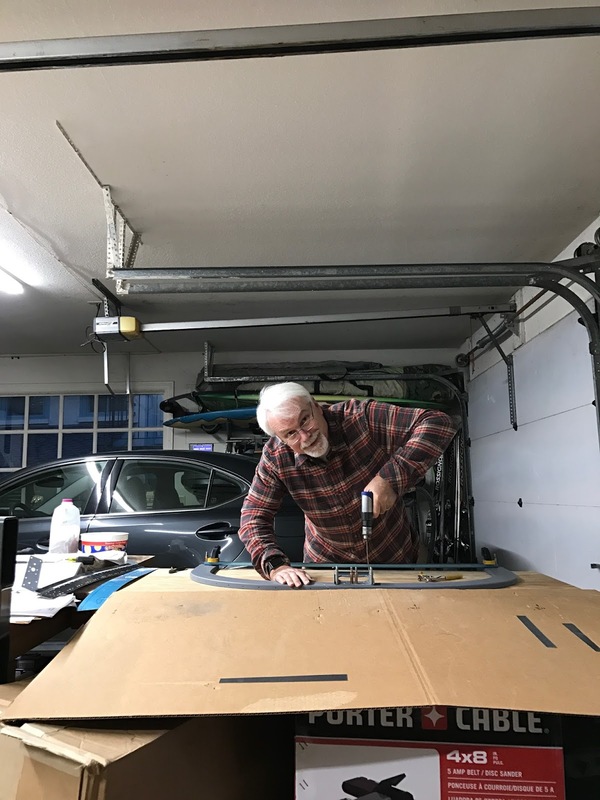 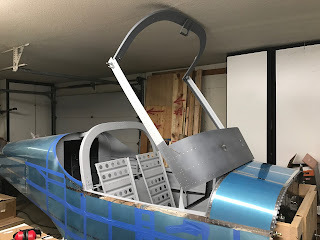 We put on the star and some new fangled LED multicolor lights and left Deb in charge of the rest of the decorating and retreated to the garage for some more RV-14 building!!! 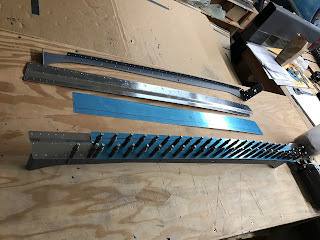 I cut several hinge strips to size and match drilled to the channels. I also finished up some more prep work on the canopy rails including countersinks and match drilling. 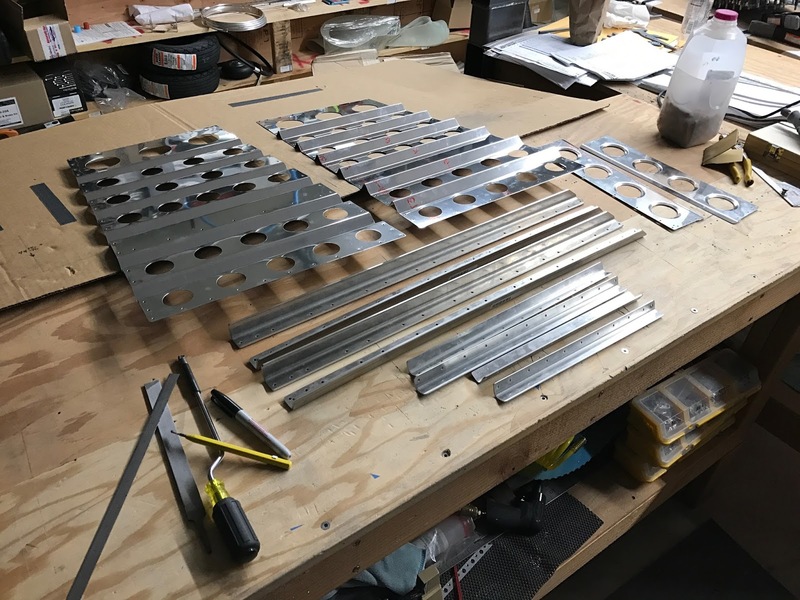 I now have another stack of parts ready for scrub, acid wash and priming tomorrow. 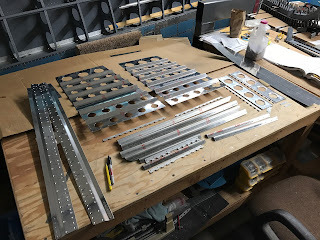 There is a window of slightly warmer weather coming up so I decided I should get as many parts prepped and primed before the next wet cold cycle of weather sets in next week. Today I skipped ahead to chapter 39 and started prepping the seat back parts. I filed the edges of all the heavy angle pieces and smoothed all the holes in the seat backs with the dremel drum sander attachment. I cut several pieces apart and trimmed to size using the bandsaw. It's been cold and I have been lacking motivation to get out in the garage the last couple days. 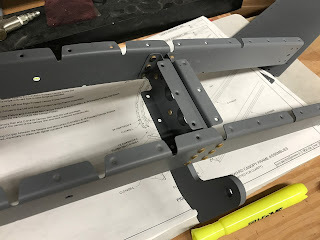 Today I bundled up and put together the aft canopy frame and handle. Here I am match drilling the handle to the frame halves. 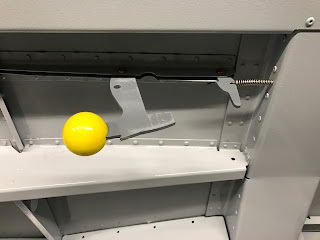 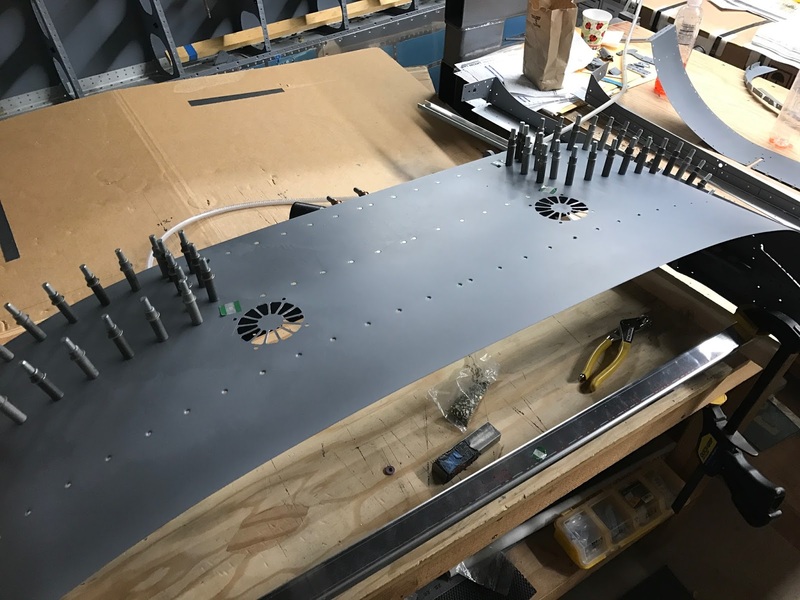 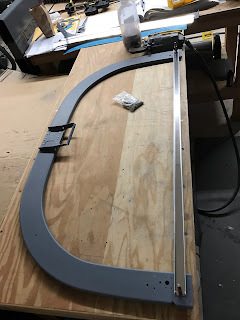 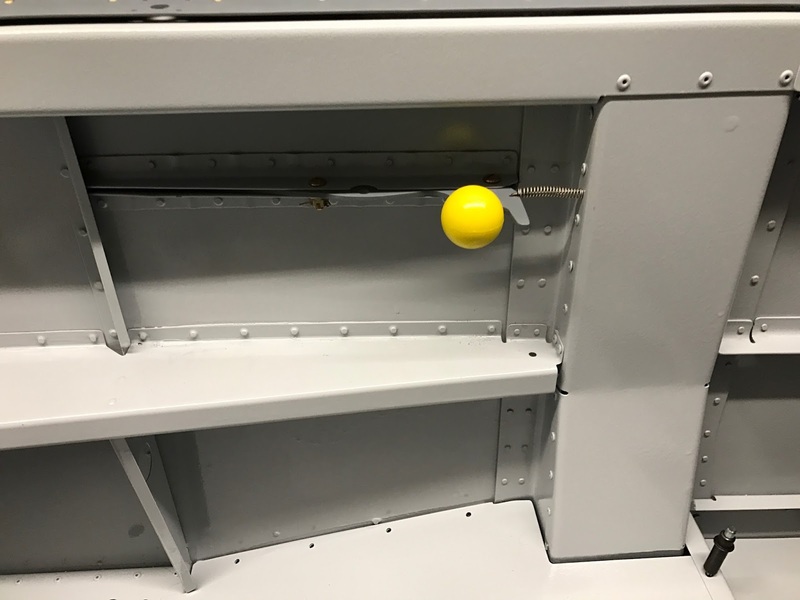 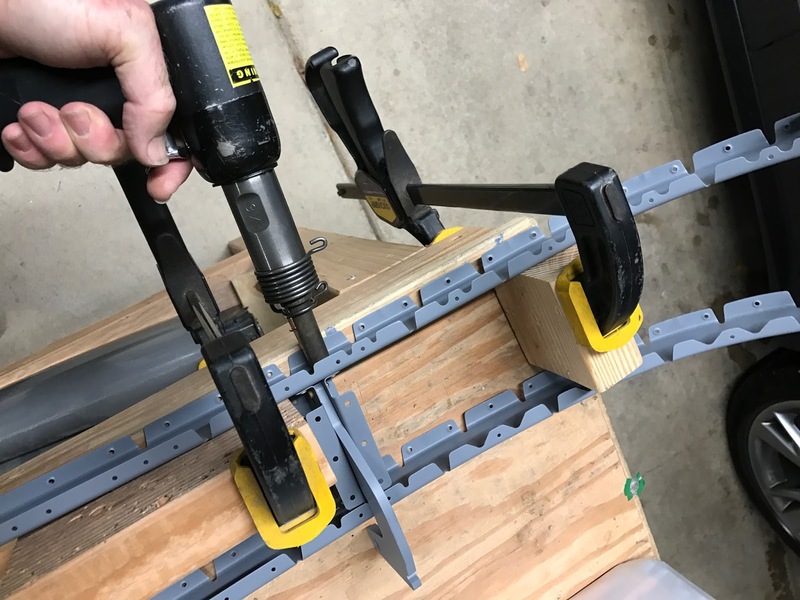 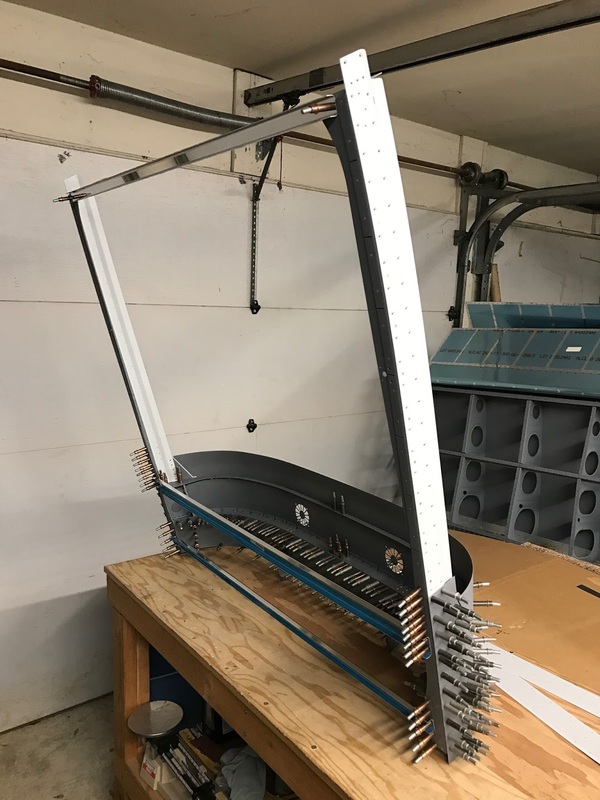 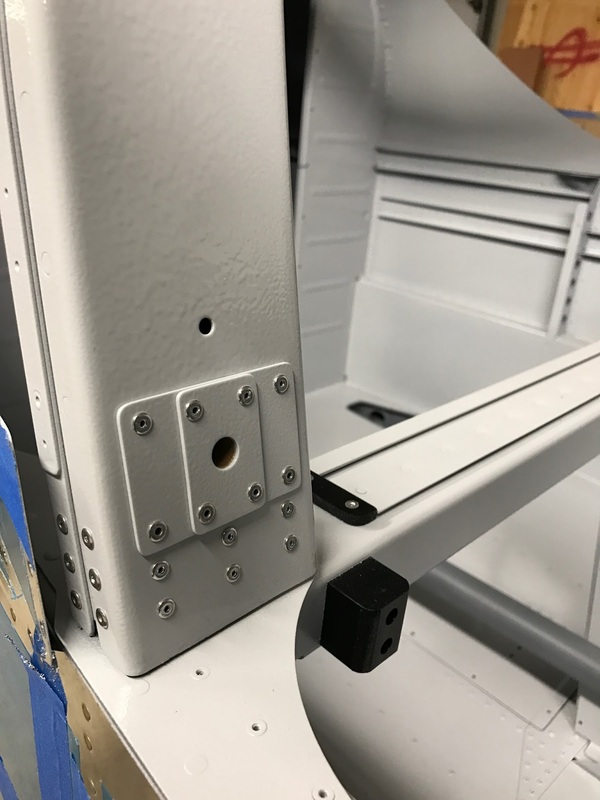 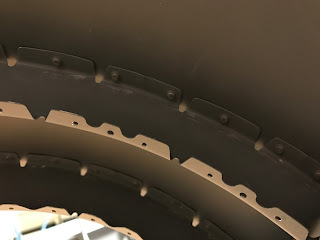 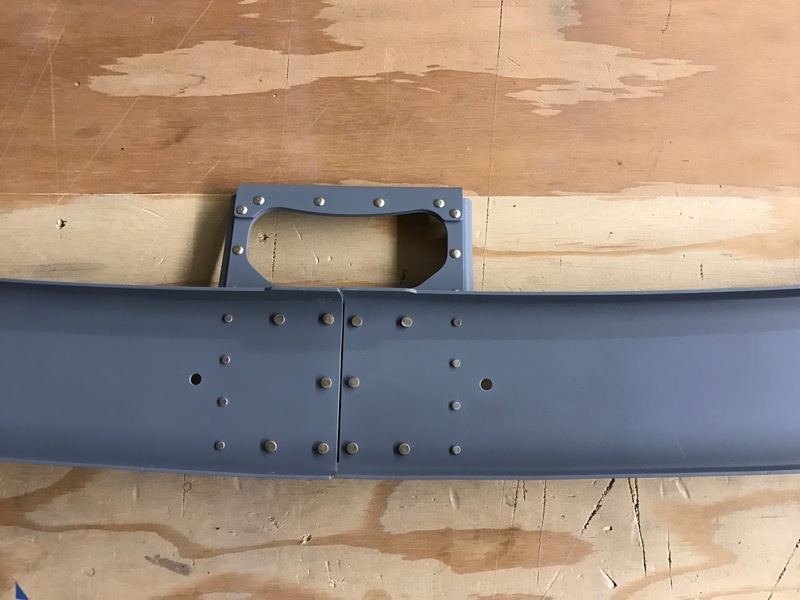 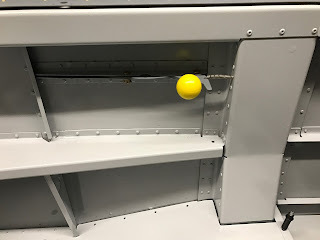 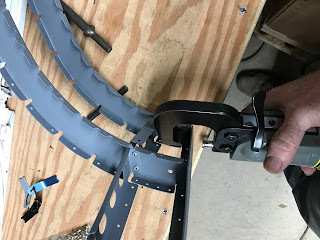 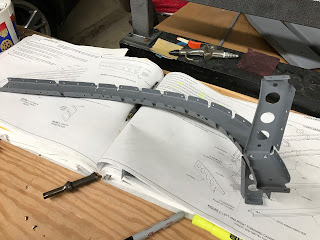 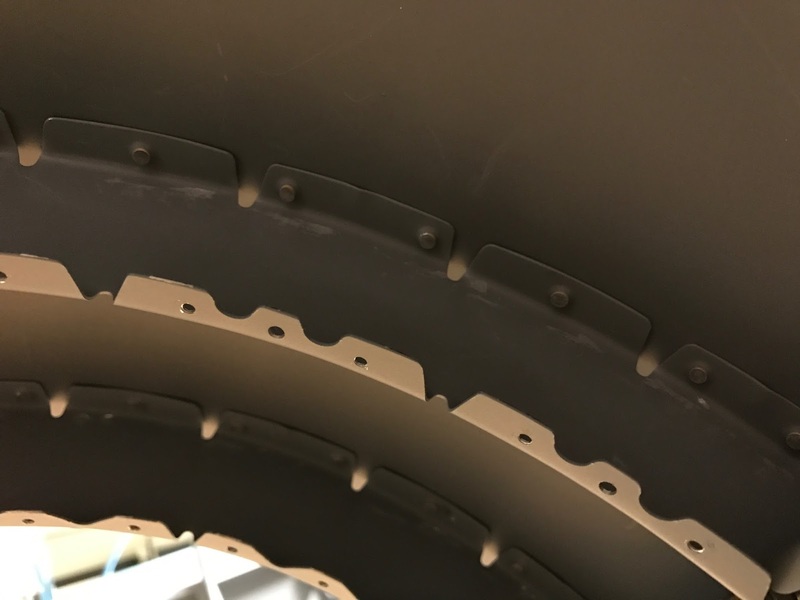 You cleco a spacer channel to the bottom of the two frame halves and then you cleco the pilot holes in the handle to hold the frame in position. I also clamped the spacer channel to the table to ensure the frames were flat while drilling. Here's the completed rear canopy frame with the spacer channel clecoed in place. 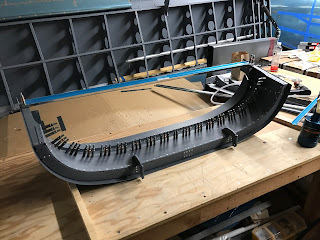 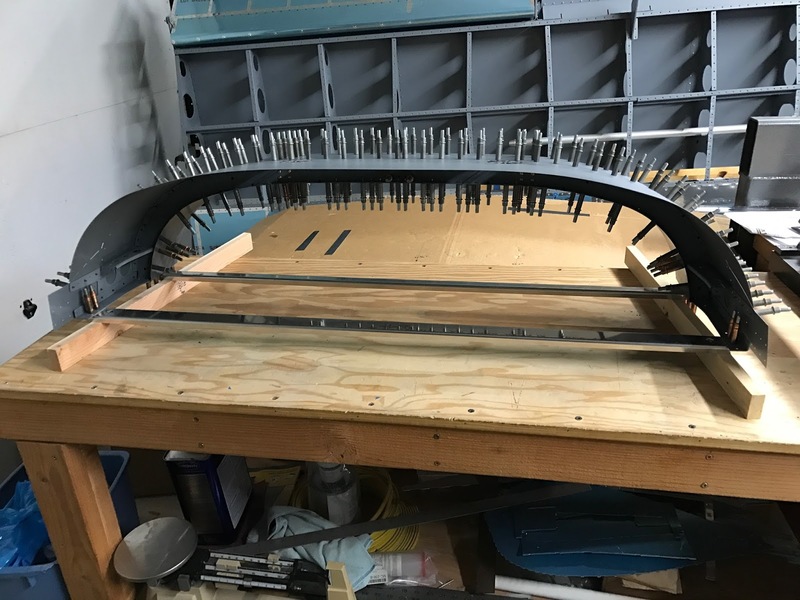 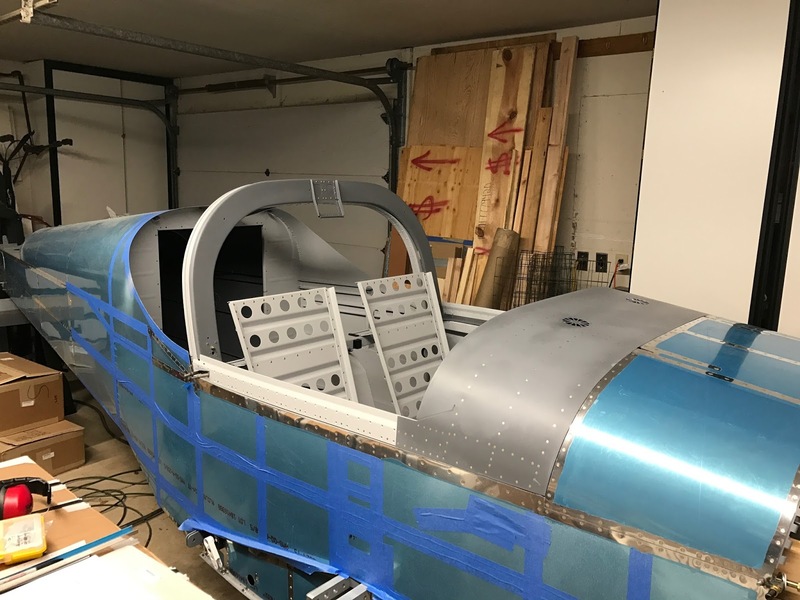 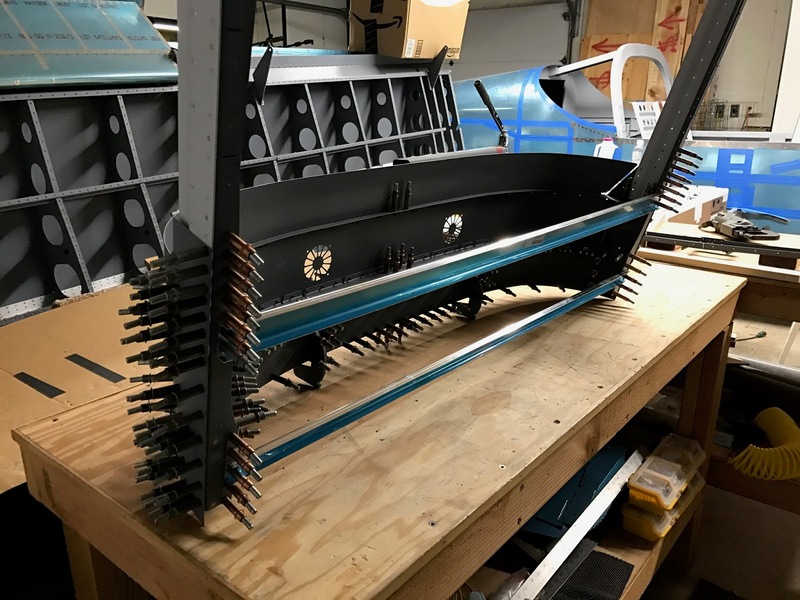 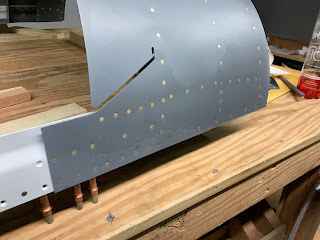 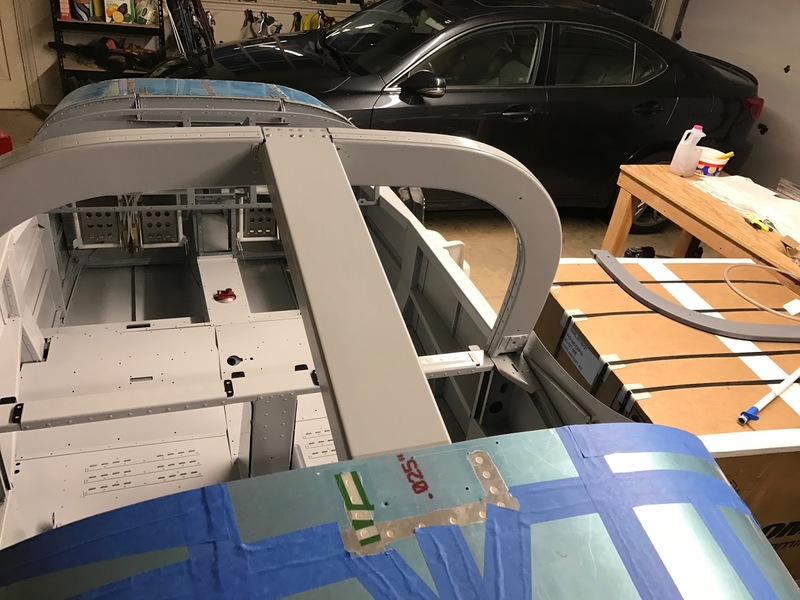 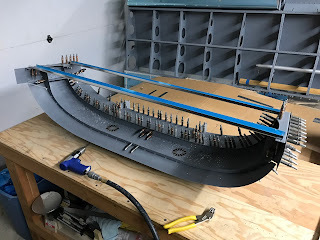 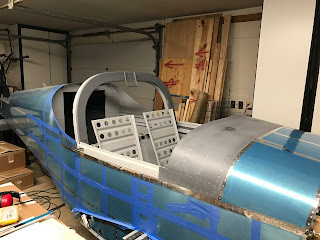 I finished up the day working on forming and match drilling the canopy side skin and rails. 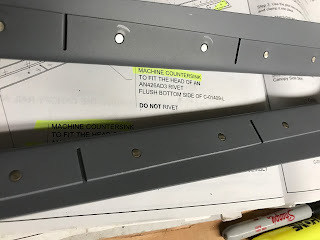 Lots of holes and the directions in the manual have you go through lots of steps with no riveting. 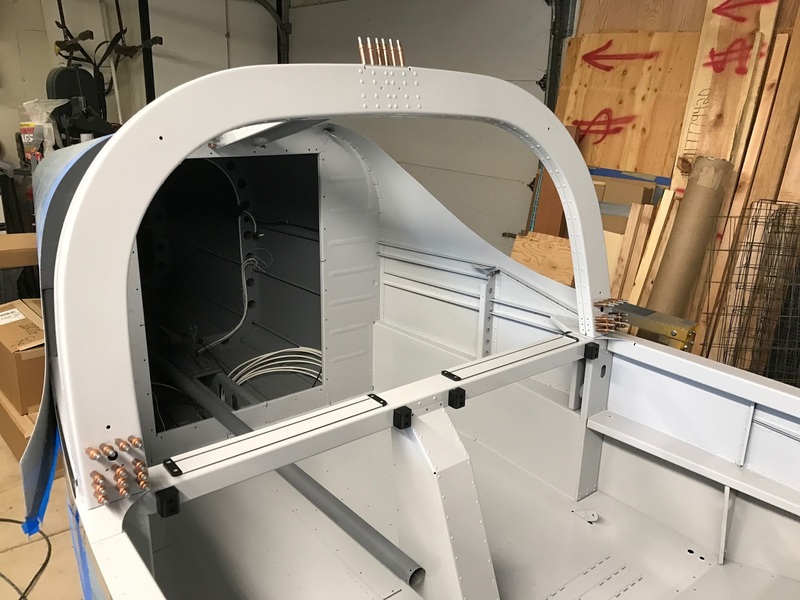 Alignment is critical on these pieces to ensure a snug canopy fit on the fuselage. I reached a point where I needed to have the roll bar assembly riveted in before I could continue with the canopy frame, so today I assembled the roll bar. 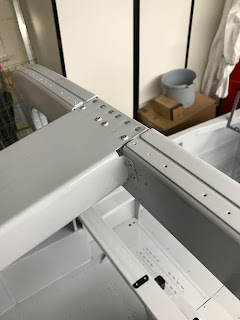 First I clecoed the roll bar in place, hit it with a rubber mallet to make sure it was seated on the bases and then match drilled the required holes into the bases. Then I removed the assembly and deburred and cleaned up all the drill chips. Then I assembled it again and did the riveting. 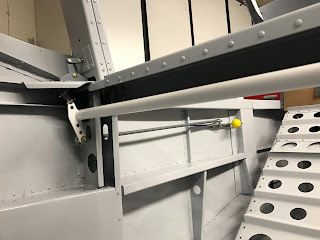 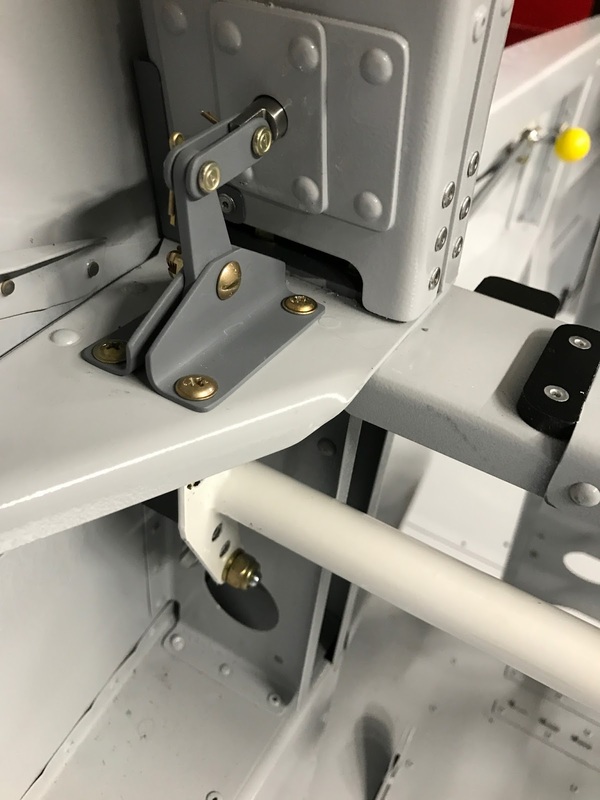 The roll bar is pull riveted to the bases because there is no access to the inside. 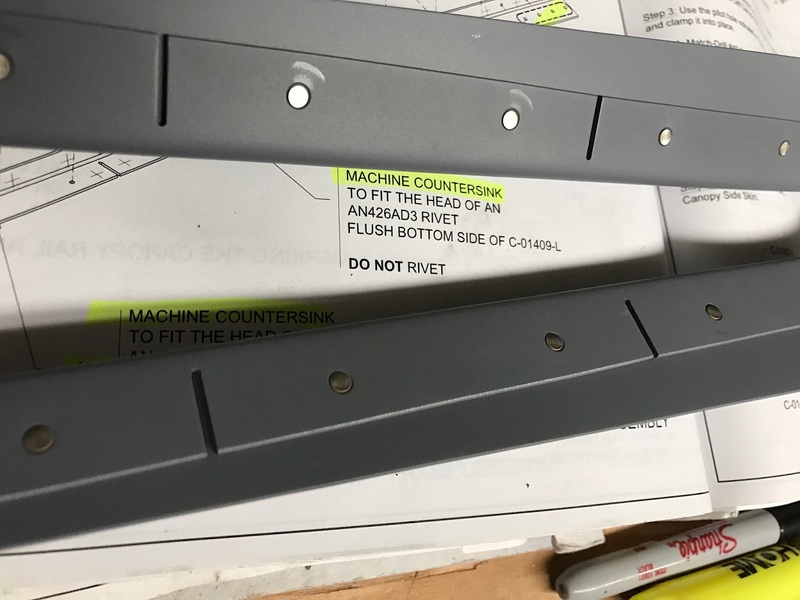 I used my pneumatic pull riveter for these. By the time I finished riveting the bases I had used all the rivets provided in the kit. 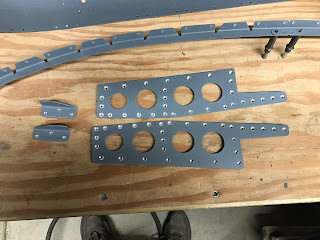 They cut the count close- no extra opps rivets in this kit. 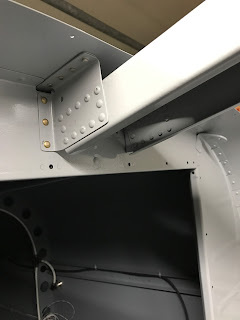 Here I've attached the bushing and the doublers with pull rivets. 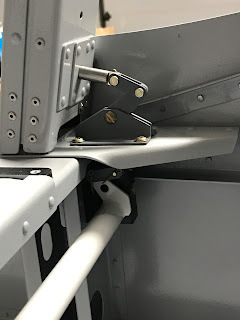 The roll bar brace gets attached with some hefty pull rivets on the top. 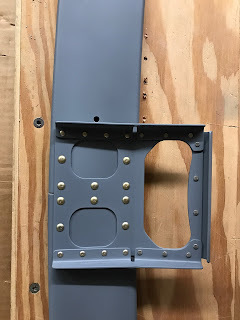 Flush rivets are used to attach the brace to the top skin. 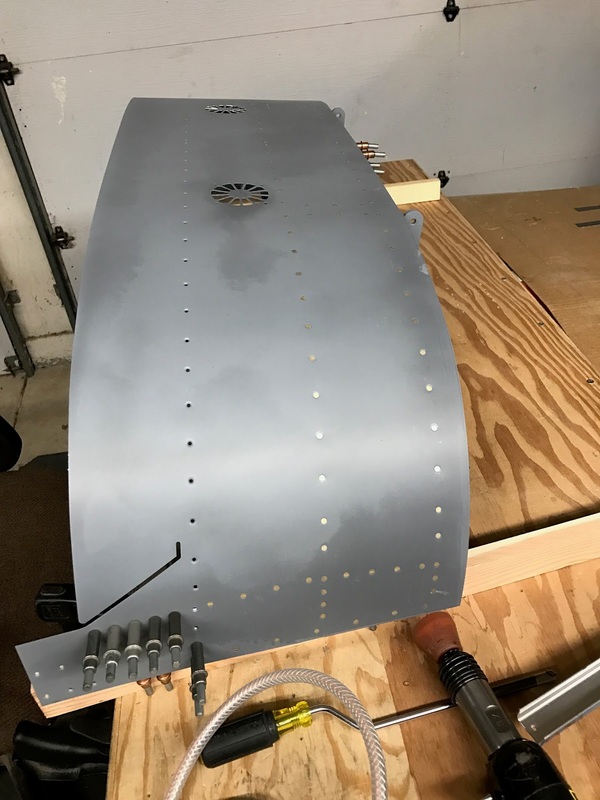 I finished up today by riveting in the skin diagonal longerons.